As January draws to a close, my detox soup trial must also come to an end. Since 30th December I have had a fruit smootie for breakfast, a large lunch and then a soup for dinner. I have also cut down on my cakes, biscuits and chocolate consumption – I would say by well over 50%. I have lost nearly 3/4 stone, my trousers feel like they will fall down and I can do my belt up a couple of notches. I feel trimmer and much better for myself. That’s not to say I will go back to my old ways. The large lunch and soup for dinner does not match the home routine. So I will still try to have a large lunch but will have a smaller portioned dinner. And I’ll definitely be having fewer sugary things than I normally do. 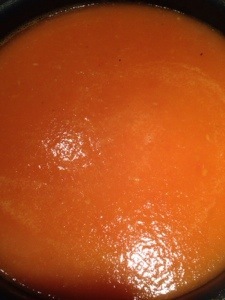 So the last soup was tomato soup, from BBC Good Food. Wow – there’s a lot of tomatoes! As with most of the soup recipes I’ve tried, you throw in an onion, carrot and celery (I haven’t quite worked out why celery is prevailent in so many soups! Please tweet me the answer!). Then you drop in the tomatos. I didn’t realise this but you need to take out the hard cores -they don’t soften apparently. The recipe called for a couple of bay leaves, and by lucky coincidence I had some on the shelf (I had to blow the dust of the lid first!). 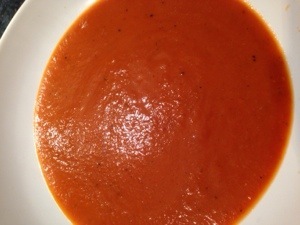 Let it simmer for a 25 minutes, give it a blizt and there we have it – tomato soup! The great news is that I’ve gone down another notch on the belt. My shirts feel looser and my trousers felt like they are falling down. So something is going right! Tonight’s soup is beetroot. Whilst browsing in the supermarket I saw some cooked beetroot. I love beetroot and thought a beetroot soup would be lovely, so wondered about trying it. I searched for a couple of recipes and this one seemed easy enough. I wasn’t going to bother with the croutons or goat’s cheese. Very simple: soften the onions add in garlic, beetroot, stock and balsamic vinegar and that’s it pretty much done. 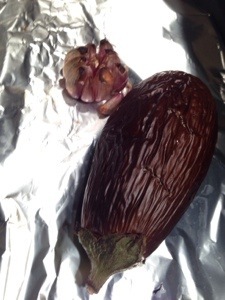 You only need to bring to the boil and then simmer for a couple of minutes. It’s the quickest soup I’ve made yet! I think there was too much stock as it was quite watery. I think next time it needs to be thicker so either more beetroot or less stock. It was really yummy. I’m not sure what the vinegar brought to the table though. If you’d like to suggest a soup for me to try, tweet me @jelly_wobbler. We had a packet of mushrooms in the fridge which looked like they were about to turn bad so I thought I’d use them for my evening soup. I did a quick search and, surprisingly for a Jamie Oliver recipe, this one looked pretty simple. I only had 300 grams of mushrooms so decided to half the weights. I was quite glad I did as I got a bit impatient peeling the mushrooms! In went all the ingredients, including some parsley we had (very rarely do we have herbs, let alone the ones required in a random recipe!) and blitzed it all up when cooked. A VERY tasty soup, full of yummy mushroom flavour. Definitely trying this one again! We had a lovely roast chicken lunch with potatoes, broccoli, parsnips, carrots and red onion (which was in the baking tray soaking up all chicken juice). We had made too many vegetables and couldn’t eat them all so bunged them in a pan with some chicken stock and whizzed it up with a handheld blender when hot. Wow – this was an unexpected success. The roasted red onion really came through and it was probably one of the best soups so far! An update on the weight loss. I can now take off two pairs of jeans without undoing the buttons and zip, and a suit which I had to breathe right in so I could do up the top button, is dangerously dangling on the precipice of my hips. It feels great to fit into those jeans without the muffin top and the deep breathe to do up the button. My goal of wearing my white slim-fit shirt without it looking like the buttons will pop out is looking better everyday!! Suggest a soup recipe for me to try @jelly_wobbler or in the comments below. I’ve followed my smoothie – lunch – soup diet for about three weeks now. I’ve seriously cut down on my sugar/chocolate/cake intake, and I’ve lost about half a stone already. My trousers are feeling looser and my shirts aren’t so tight around the middle. Something is definitely working! The next soup is an old favourite – leek and potato. Following on from the chunky chicken soup, I didn’t blizt the vegetables after cooking, so I had something more to chewy on. Really lovely, and really whomesome. Yum! Hmmm. A lovely roast chicken on a Sunday afternoon with loads of veg, roast potatoes, stuffing and Yorkshire pudding. I’m not very good with carving chicken and I make a bit of a hatchet job with it. The carcass always goes in the bin. I’ve never done anything with it, mainly because I don’t know how or what. 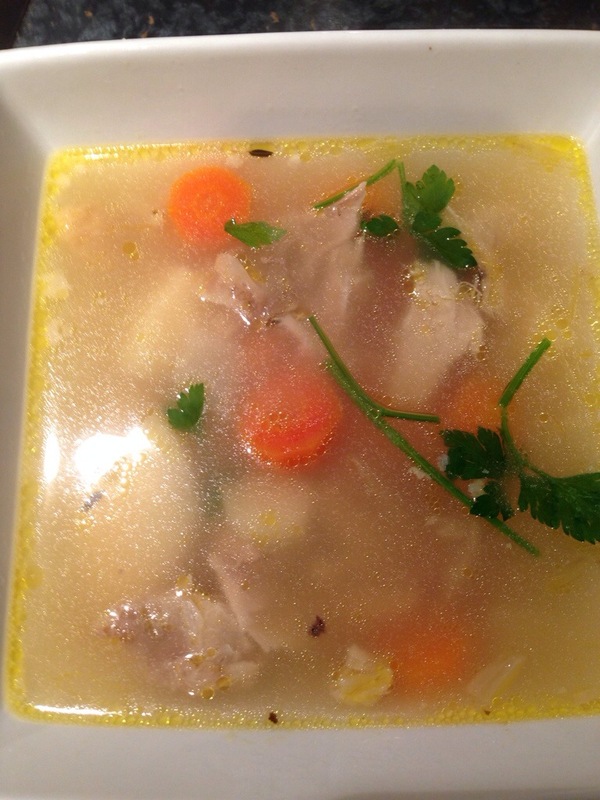 I know that you can use it to use stock or soup so I had a go at making chicken soup. Searching online looking at the recipes, it seems incredibly easy. What surprised me was the length of time it takes to cook. You cover the chicken carcass with cold water (which meant a LOT of water) and simmer it for an hour. Then you add in the chopped vegetables (any will do – I used carrots and parsnips) and then simmer another hour! Then you throw in some parsley and job done. I thought the simmering process would reduce the water and thicken it up a bit but it didn’t. The end result looked very thin and watery, with quite a bit of fat/oil peppering the top. You can see the yellow far around the sides in the photo below. Unlike the other soups I’ve tried (which have been blended), whilst it felt too watery, there was some substance in there, something to chewy on, which made it feel more filling. There was so much though it’ll last quite a few days! Here’s a soup I never thought I’d eat squash and cauliflower soup (unless of course someone ordered it for me in the restaurant game!). My wife was making Weight Watcher’s no-point vegetable curry and she had gone to the trouble of chopping up all the ingredients. Now, you know when you cook something you like, and then it have it lots and lots of times, until you get sick of it. Well, that’s where I was with Weight Watcher’s no-point vegetable curry. So with my latest daily detox soup jelly wobble, she gave me my share of veggies and make a soup for me. And in the spirit of this blog, I gave it a go! Very thick soup and, to be honest, couldn’t really taste the cauliflower (a good thing). And of course I felt very healthy and satisfied. My wife made the soup tonight. It’s not a combination I would have put together (and would probably eat again) but nevertheless it was edible and fairly tasty. My detox plan is going well. A fruit smootie in the morning, a big lunch (today was cous cous and lamb meatballs) and soup for dinner. I had a slice of birthday cake in the office but that was it (which is amazing by my standards and judging by the amount of left-over chocolate from Christmas!). http://www.bbc.co.uk/news/magazine-24621394 – coffee or smoothies – which is better for you. My best intentions of a soup a day were somewhat scupper by lack of planning and foresight as to what was coming up diary-wise. Nights out and lunches with friends meant I had to put my soup plan on hold. Back to it today with a carrot and coriander soup. Really easy and just like the pea soup – carrots and coriander instead of the peas! The BBC recipe also called for a potato so, learning from my heavy, starchy last attempt I just put a small one in. Onions, stock and a large handful of coriander all blitzed together made a rather lovely soup! I feel healthy again!!! Do you have a (easy) soup recipe you’d like me to try? Tweet me at @jelly_wobbler.